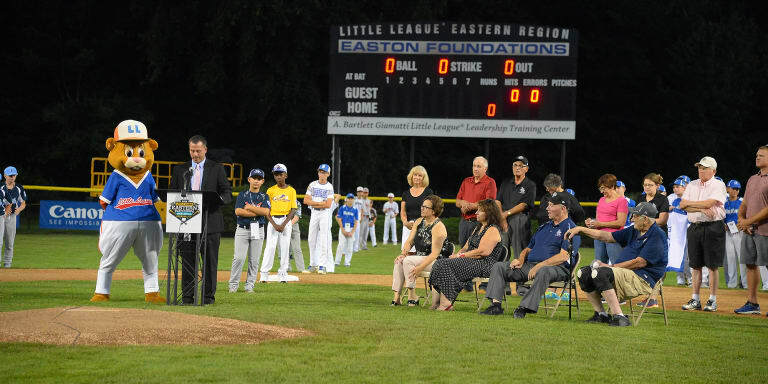 Hundreds of excited players and their families packed Leon J. Breen Field on Saturday Aug. 4, as Little League Baseball® kicked off the 2018 Eastern Regional Tournament in Bristol, Conn. The opening ceremony began with each of the 12 teams from the New England and Mid-Atlantic Regions carrying their banners onto the field, where they were introduced and lined up across the infield. There was no shortage of energy, as teams came out to “Everybody Dance Now” with their hometown fans cheering them on. The 12-man umpire crew was also recognized during the ceremony, including umpire Bristol native Chris Wasieleuski, who received a rousing applause. First to speak was East Region Director Corey Wright, who ensured the players that regardless of the outcome of their games, the tournament would be an unforgettable experience. “Now I give all of you my word, I’m going to make all your Little League® dreams come true,” said Mr. Wright. Bristol Mayor Ellen Zoppo-Sassu was next to the podium, who thanked all the teams for coming and provided her own words of encouragement to the tournament’s participants. She made sure to commemorate Connecticut’s own Fairfield American team, coming off their third straight state championship. 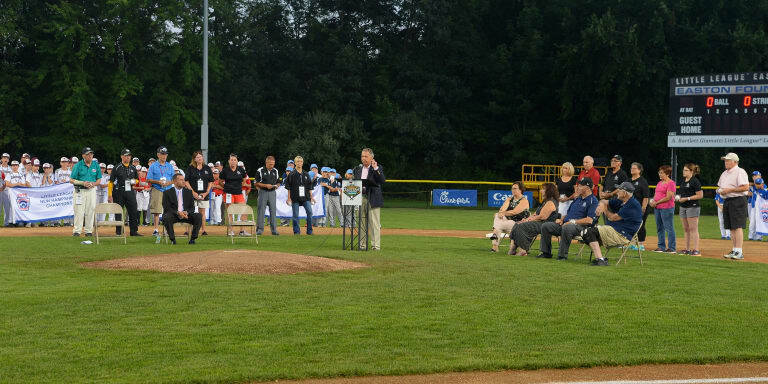 After the Little League and Parent pledges, several volunteers were honored on the field to celebrate the 25th Anniversary of the A. Bartlett Giamatti Little League Leadership Training Center in Bristol. 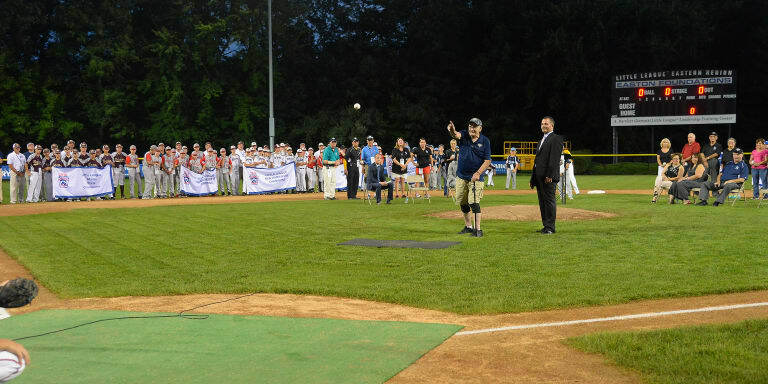 Among these volunteers was recently-retired Region Director Don Soucy and 86-year old Connecticut native Paul DiNoia, who threw out the ceremonial first pitch. 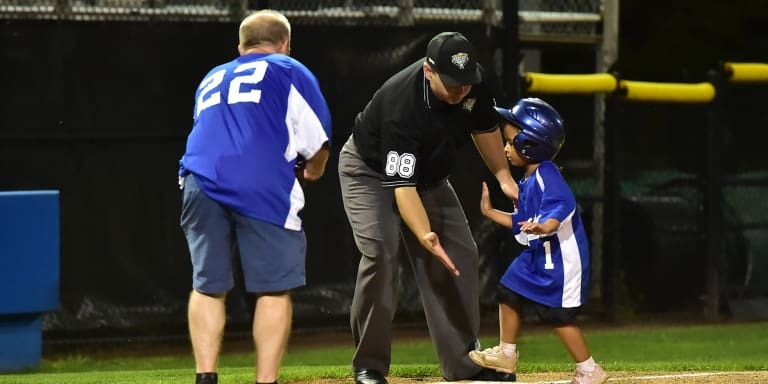 The teams then left the field to watch the 2018 Little League Challenger Division® Exhibition Game, giving children with physical and intellectual challenges the opportunity to demonstrate their talents to a packed stadium. 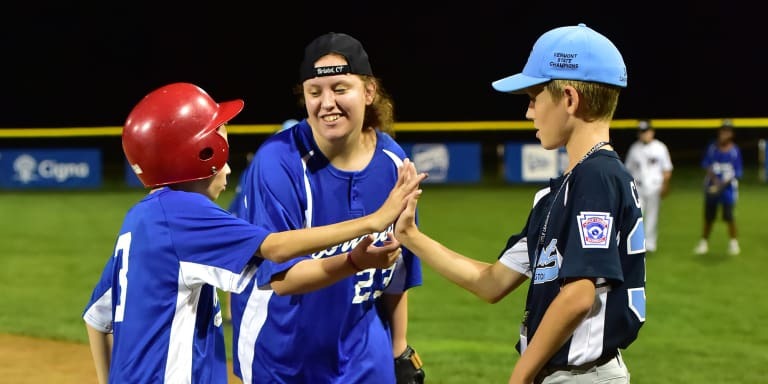 This year’s participants were Bristol’s own Ed Beardsley Challenger Little League team, which was buddied by Staten Island’s Mid Island Little League; and Vermont’s South Burlington Little League teams. 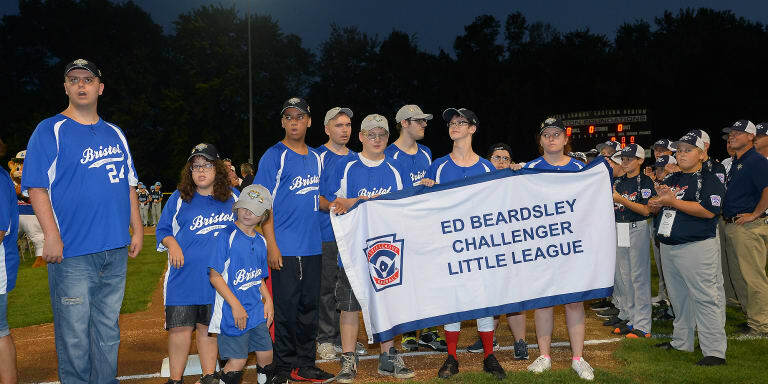 The Beardsley Challenger Little League team is named in honor of the late Ed Beardsley, who was a native of Bristol, and was a pioneering figure in the development of the Little League Challenger Division. 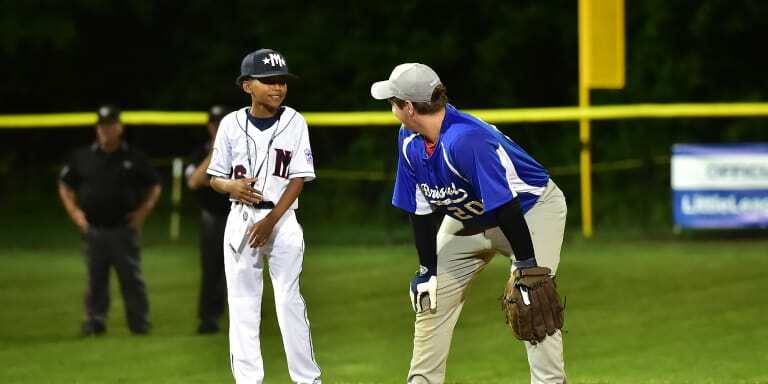 The team was split into two, eight-player teams, accompanied by their families and buddying Little League players. There was no shortage of offense in the two-inning exhibition, with the final score coming out to a 16-16 tie. Whether it was dancing to the Macarena between innings or sprinting around the bases in hope of an inside-the-park home run, the players were glowing with excitement as an engaging crowd cheered them on. One player even did his best Babe Ruth impression by calling a base hit to right field. He also thanked the Little League buddies, the state championship teams, and the umpires, for helping to make a great experience for his players. 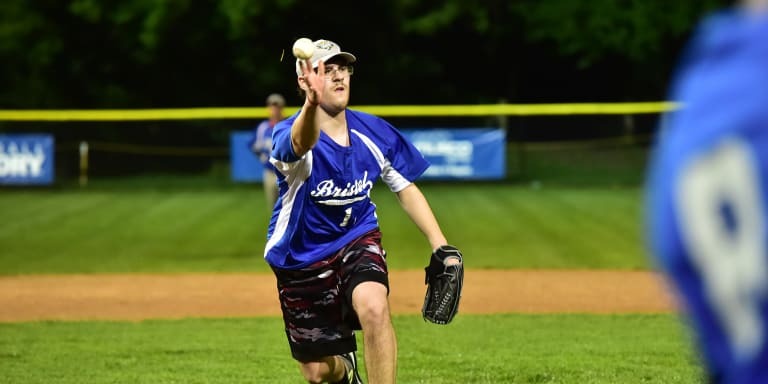 The Eastern Regional Tournament officially began on Sunday morning and is scheduled to conclude on Saturday, Aug. 11, with the New England Region and Mid-Atlantic Region Championship games. The two region champions will advance to play in the 72nd Little League Baseball World Series, to be played Aug. 16-26 in Williamsport, Pa.